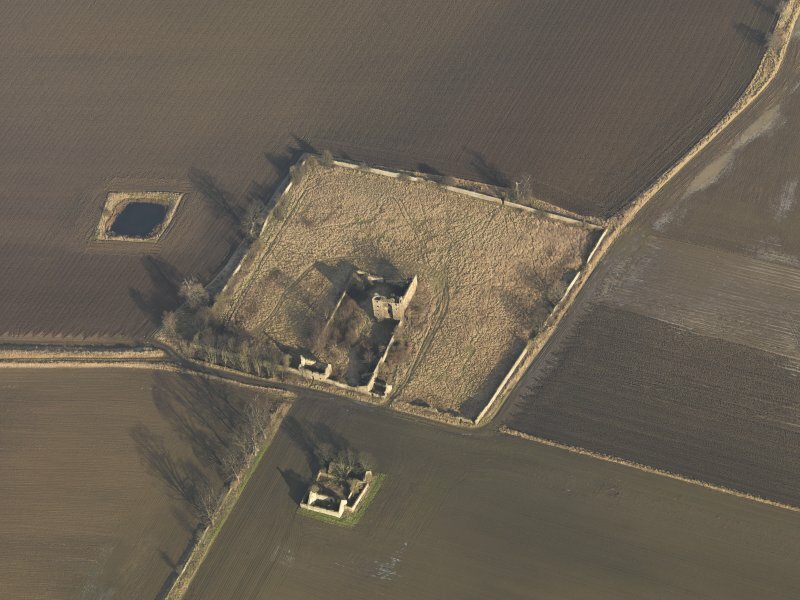 Oblique aerial view centred on the remains of the castle with the remains of the farmstead adjacent, taken from the S.
Oblique aerial view centred on the remains of the castle with the remains of the farmstead adjacent, taken from the W.
Oblique aerial view centred on the remains of the castle with the remains of the farmstead adjacent, taken from the E.
Oblique aerial view centred on the remains of the castle with the remains of the farmstead adjacent, taken from the SE. 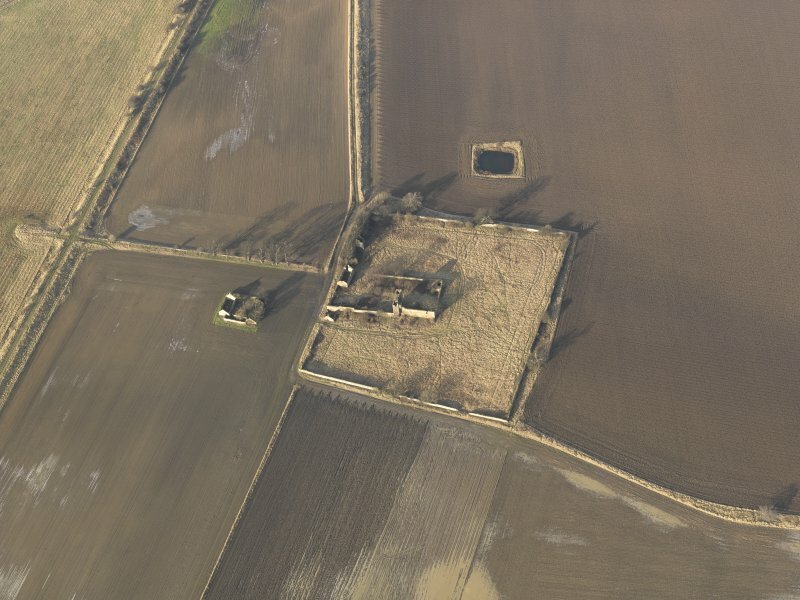 Oblique aerial view centred on the cropmarks of the rig and field boundaries with the remains of the tower-house, cottage and dovecot adjacent, taken from the NNW. 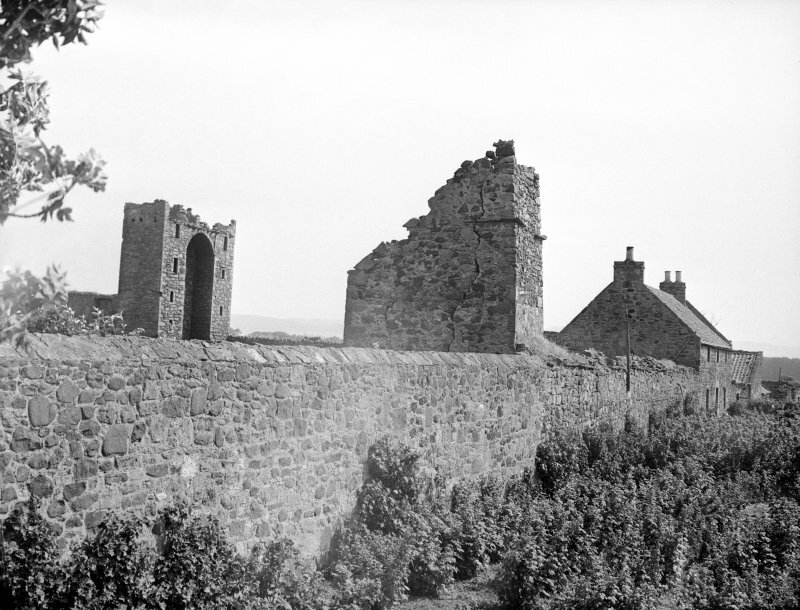 View of Saltcoats Castle, Gullane. 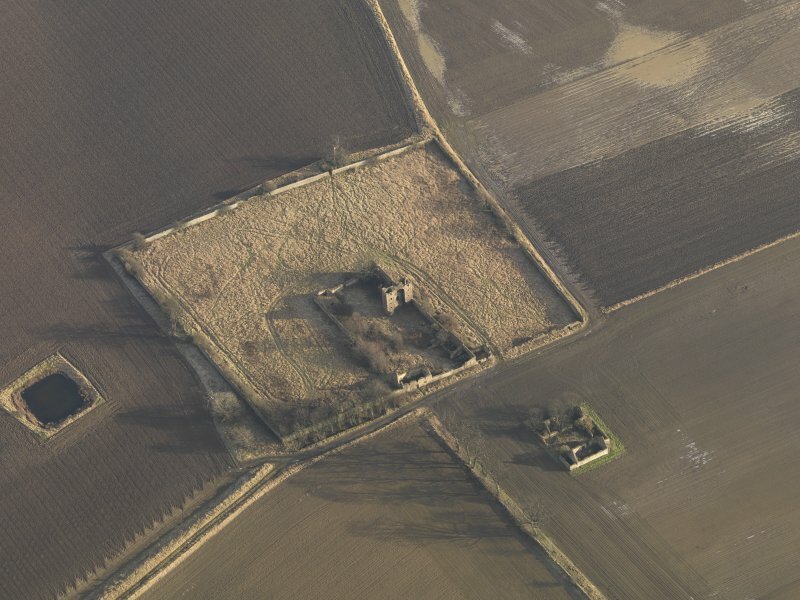 View from SE showing corbels on bartizan. 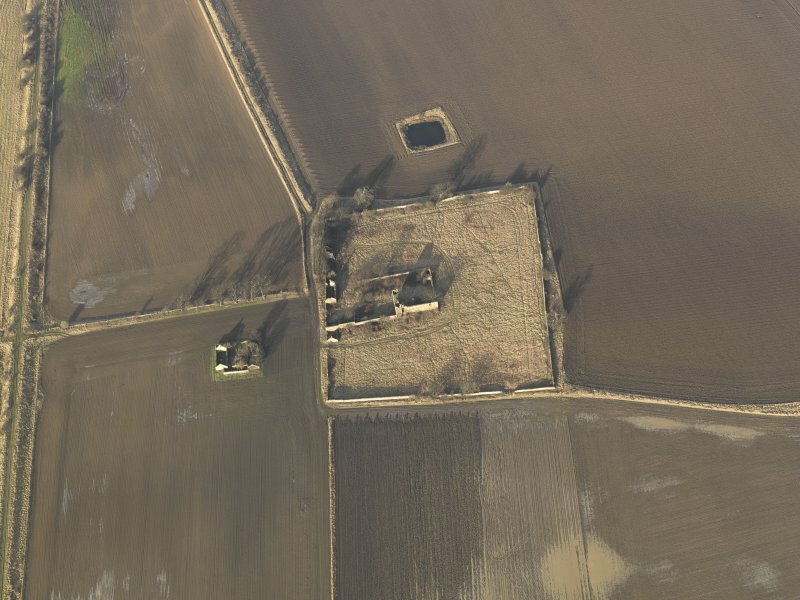 Oblique aerial view centred on the remains of the castle with the remains of the farmstead adjacent, taken from the WSW. 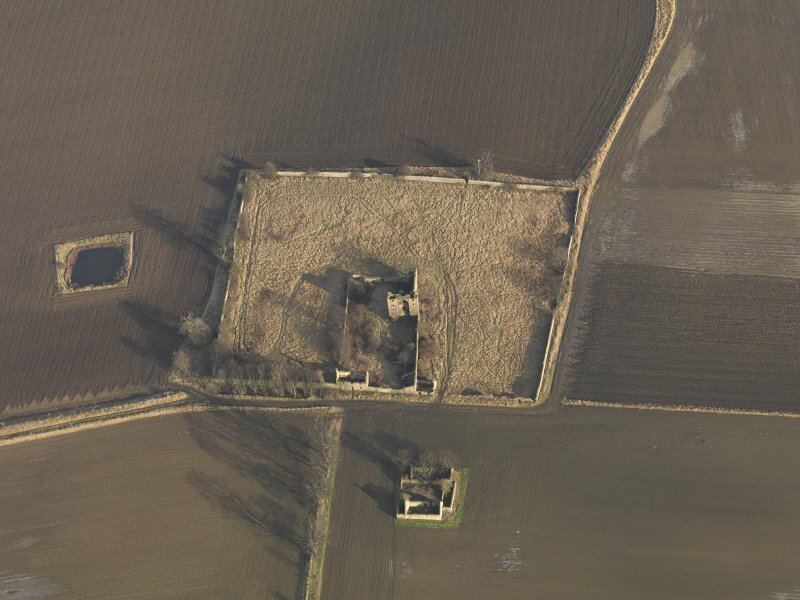 Oblique aerial view centred on the remains of the castle with the remains of the farmstead adjacent, taken from the WNW. 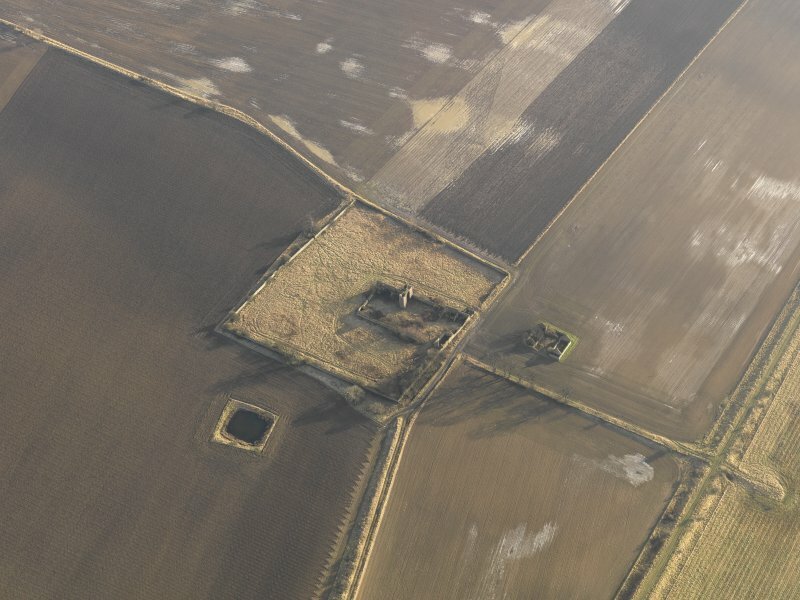 Oblique aerial view centred on the remains of the castle with the remains of the farmstead adjacent, taken from the NW. 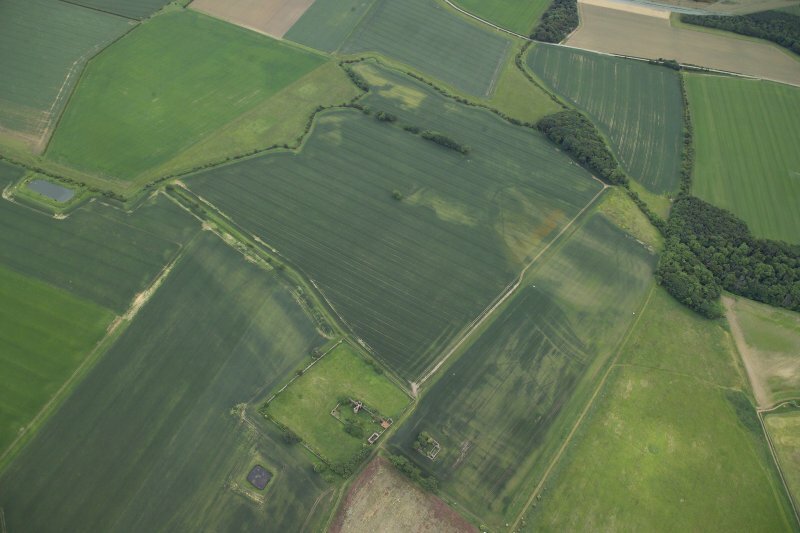 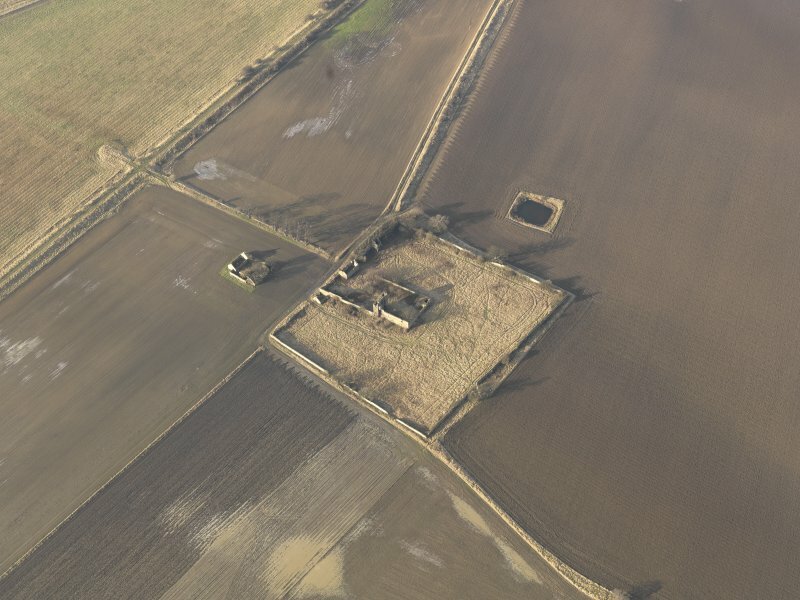 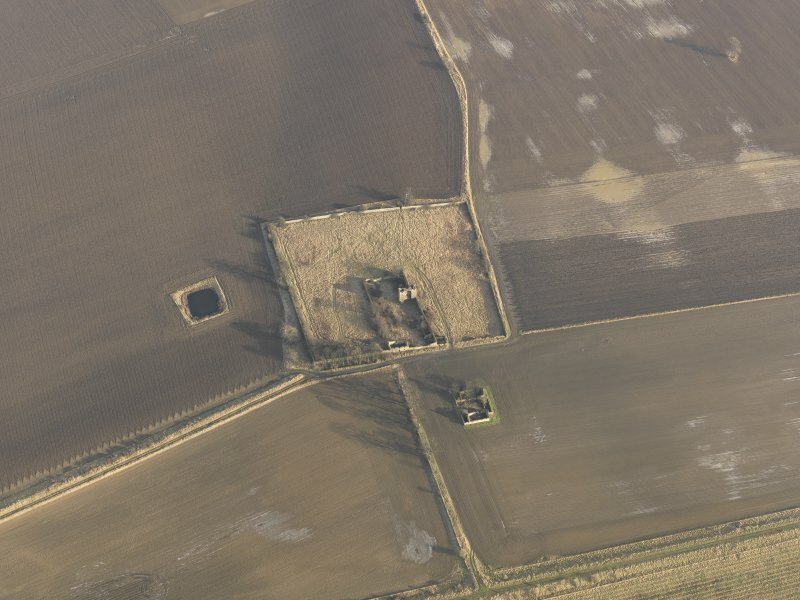 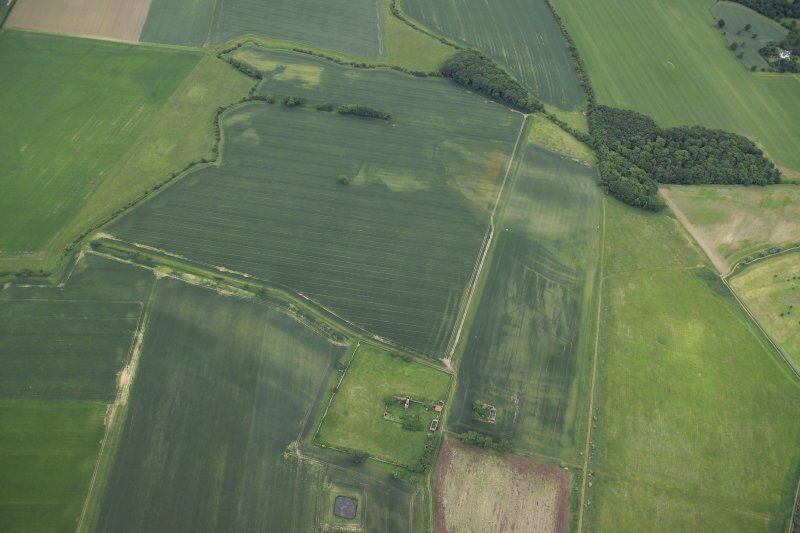 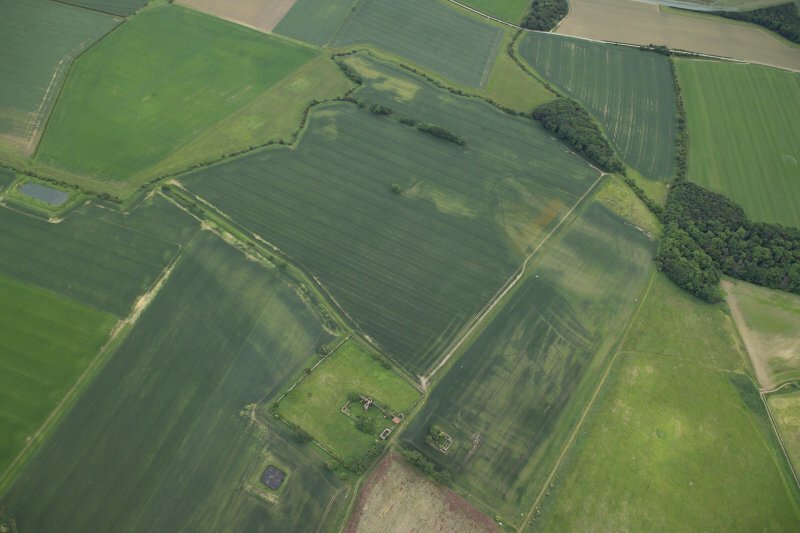 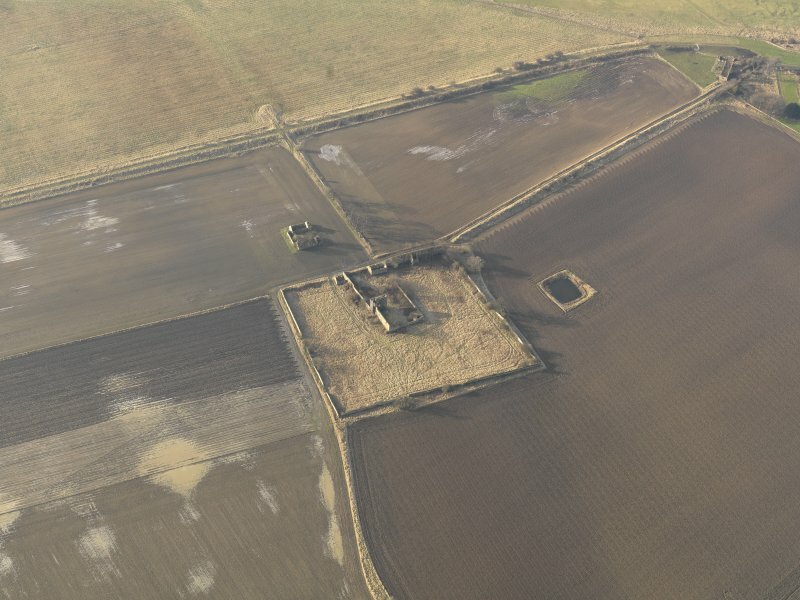 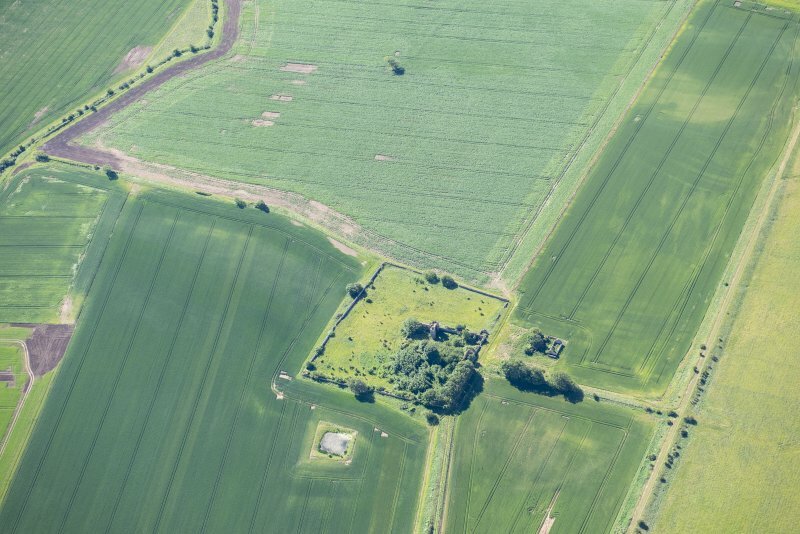 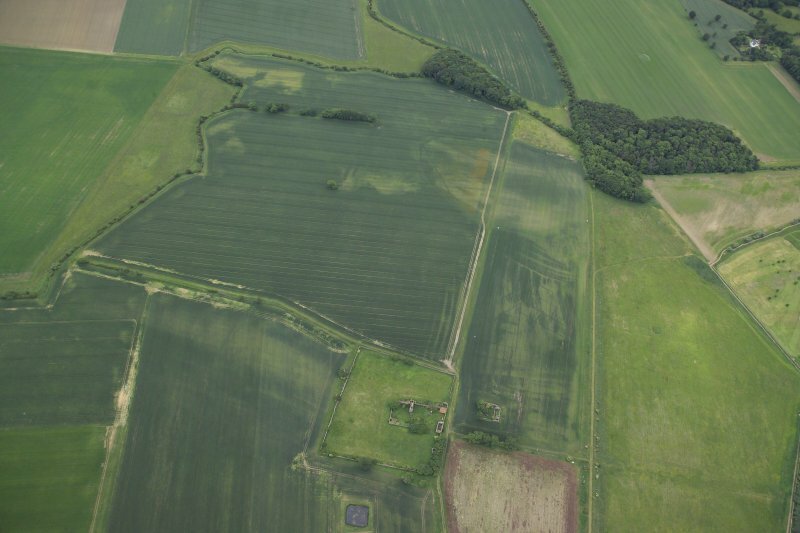 Oblique aerial view centred on the cropmarks of the rig and field boundaries with the remains of the tower-house, cottage and dovecot adjacent, taken from the NW. 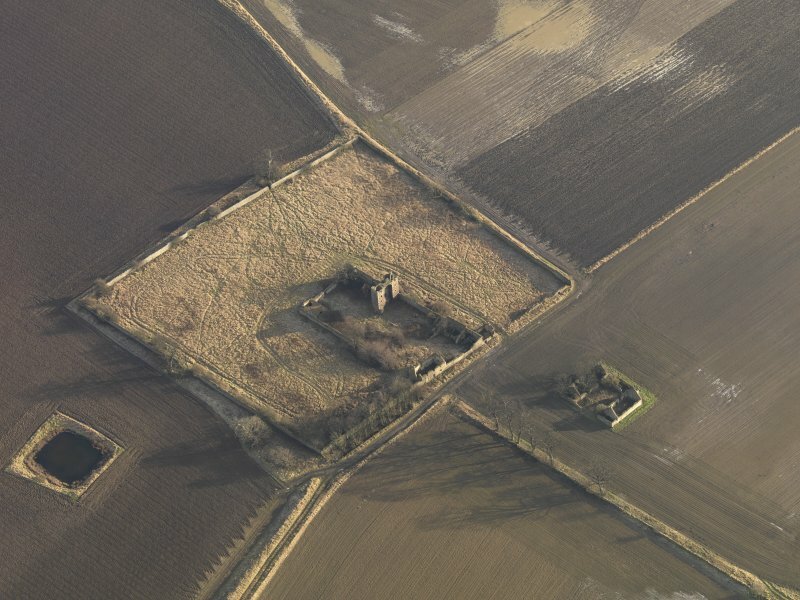 Oblique aerial view centred on the remains of the castle with the remains of the farmstead adjacent, taken from the SSE. 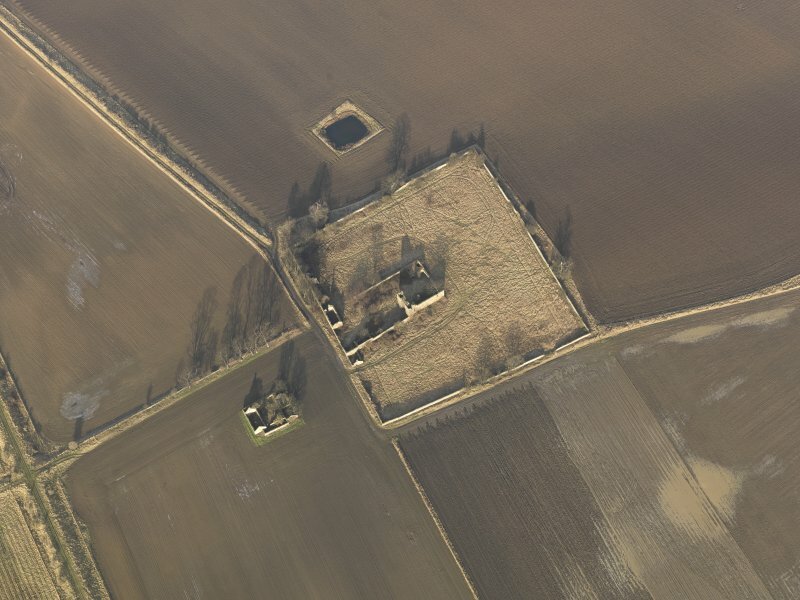 Oblique aerial view centred on the remains of the castle with the remains of the farmstead adjacent, taken from the SSW. 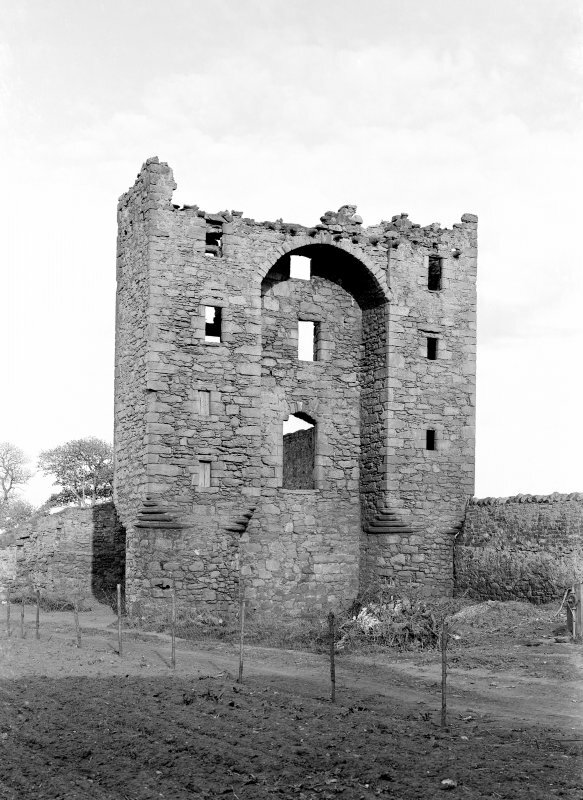 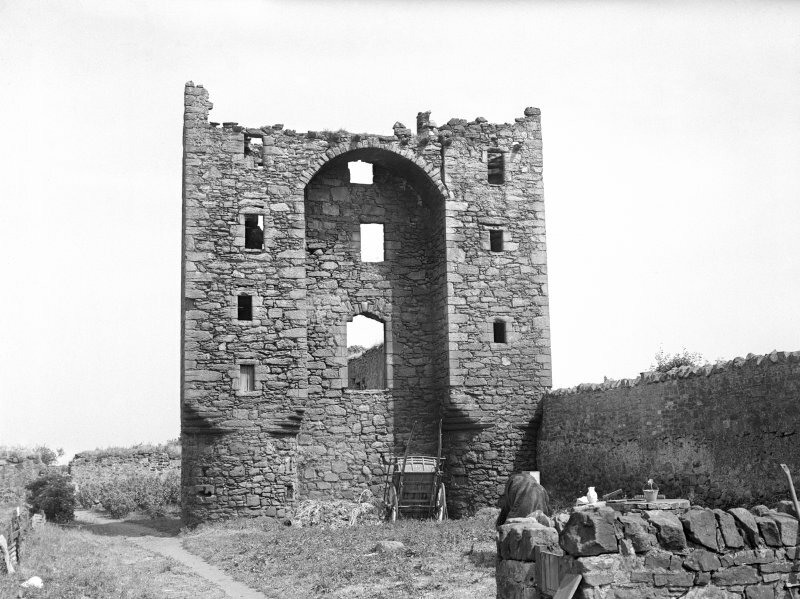 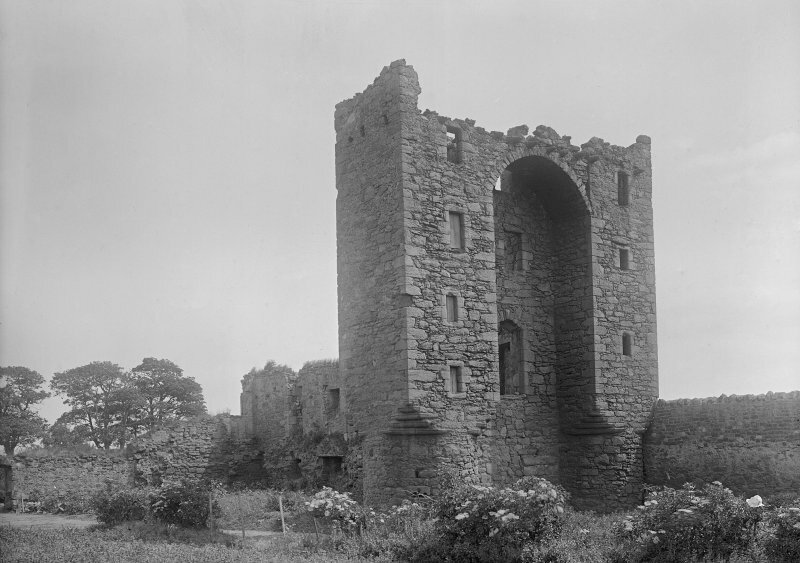 The late 16th c Saltcoats Castle consists of a main structure 72' by 23 1/2' which forms the S side of a courtyard with two projecting angle towers at the W end. 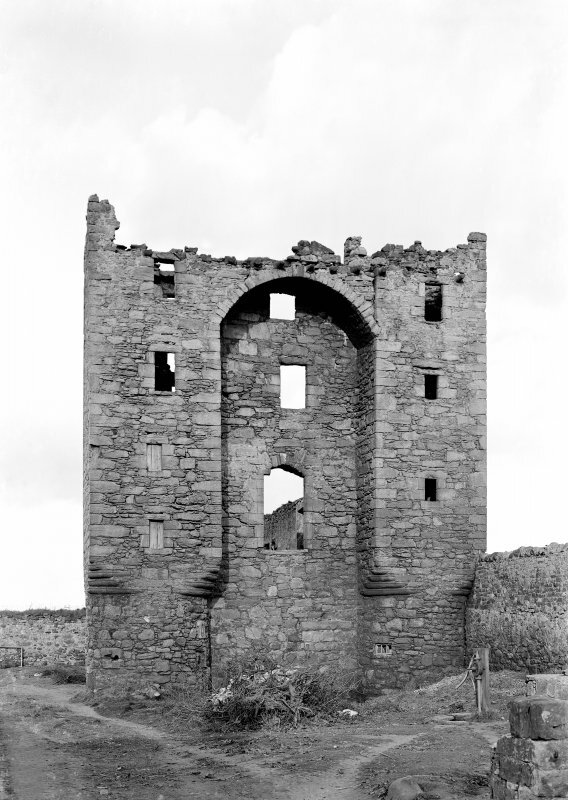 The N wall and inner partitions of the main building are absent. 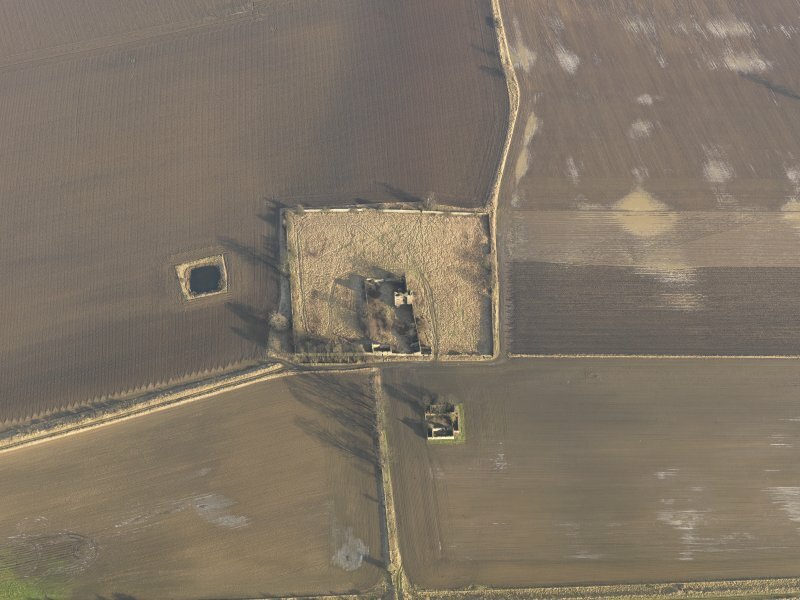 Only the ground floor of some subsidiary buildings at the NE corner remain. 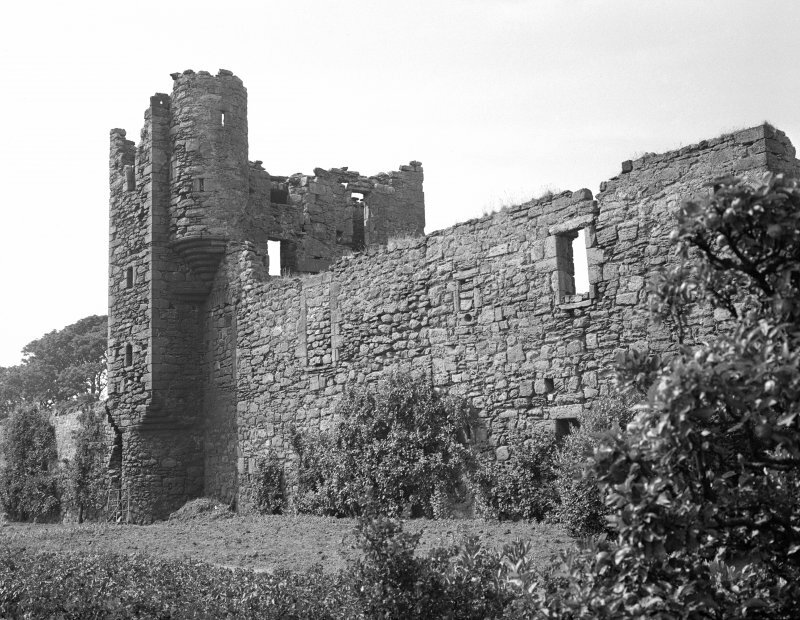 The enclosing walls exist but are much repaired. 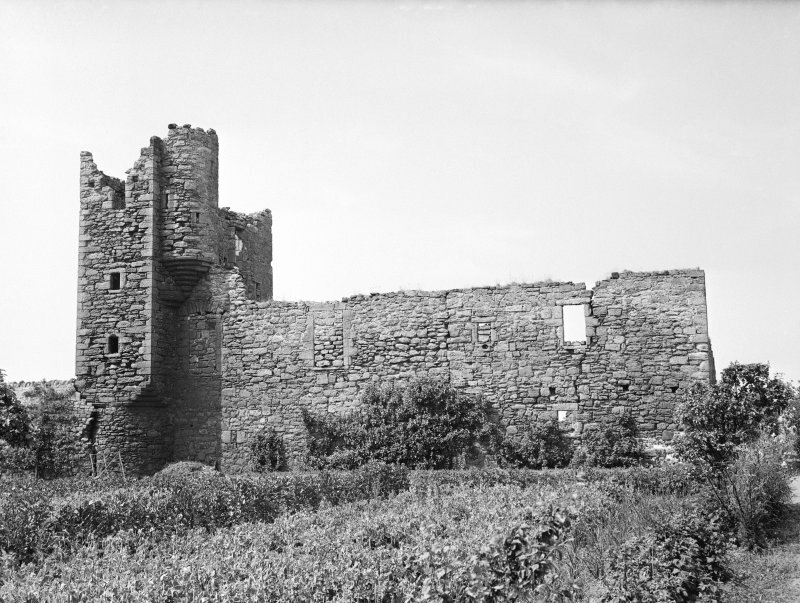 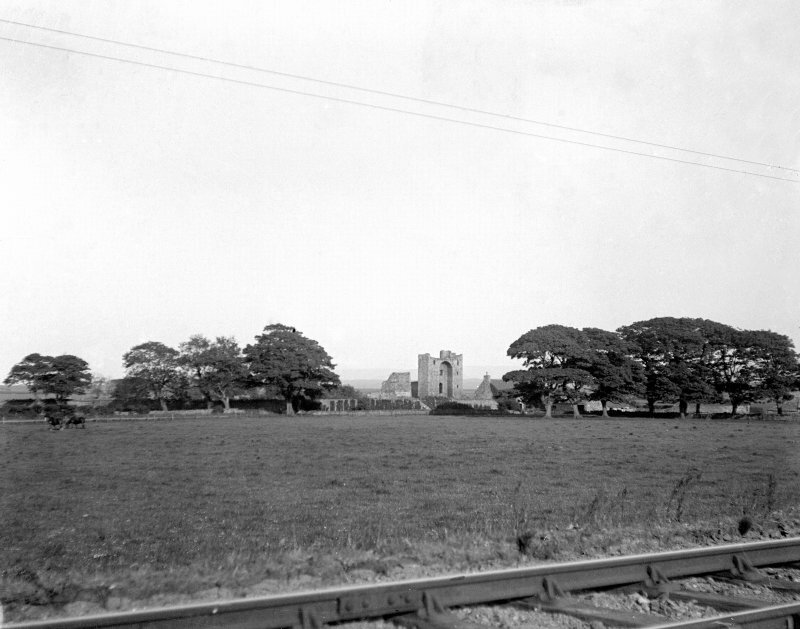 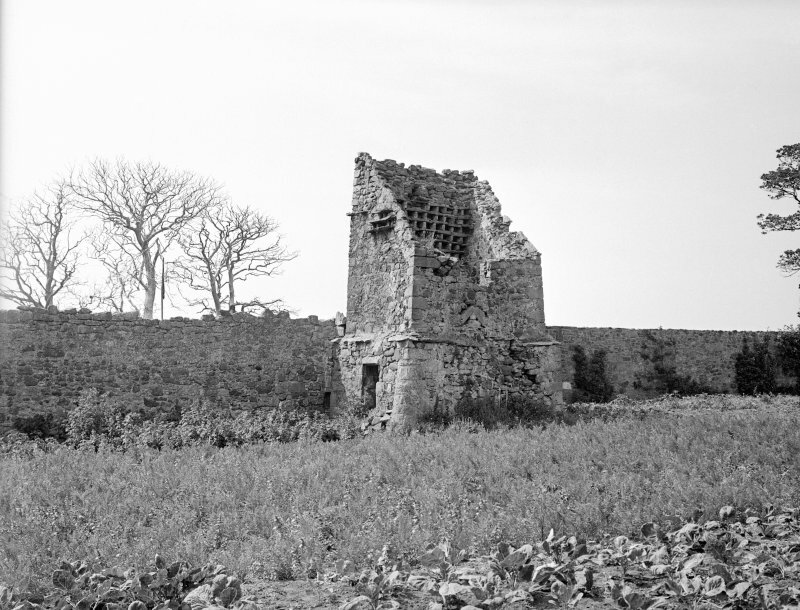 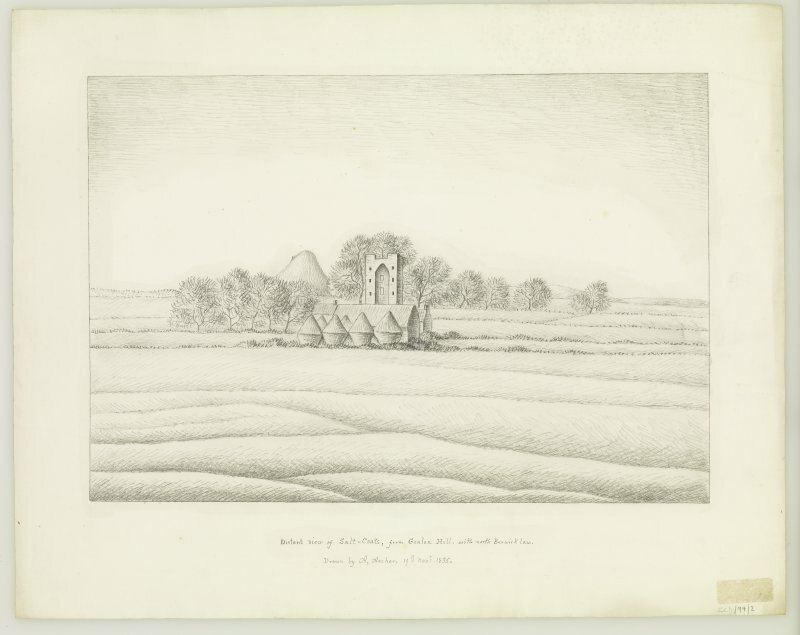 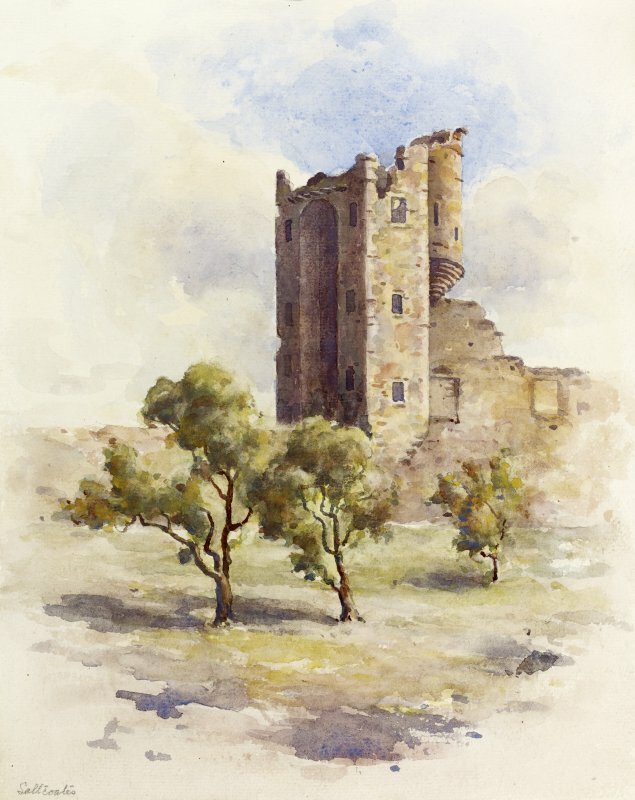 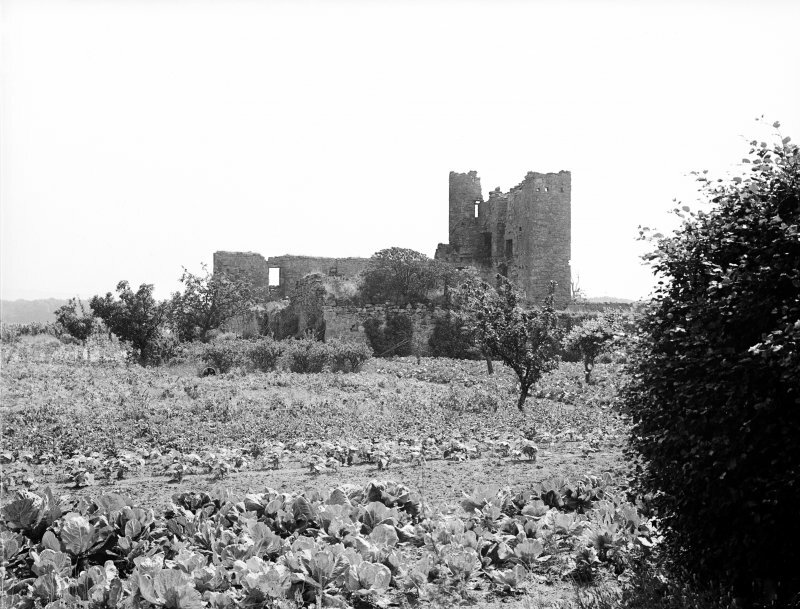 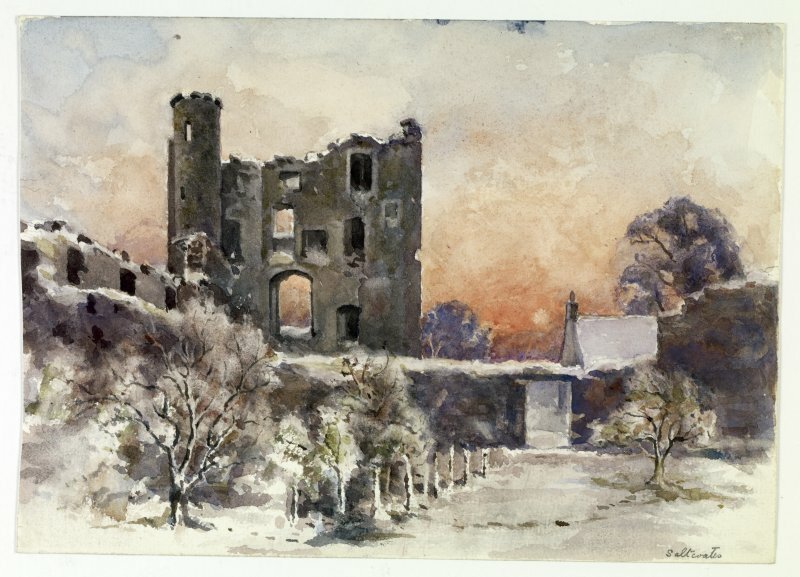 The castle was still inhabited about 1790 but most of the building was removed for agricultural improvements about 1823-4. 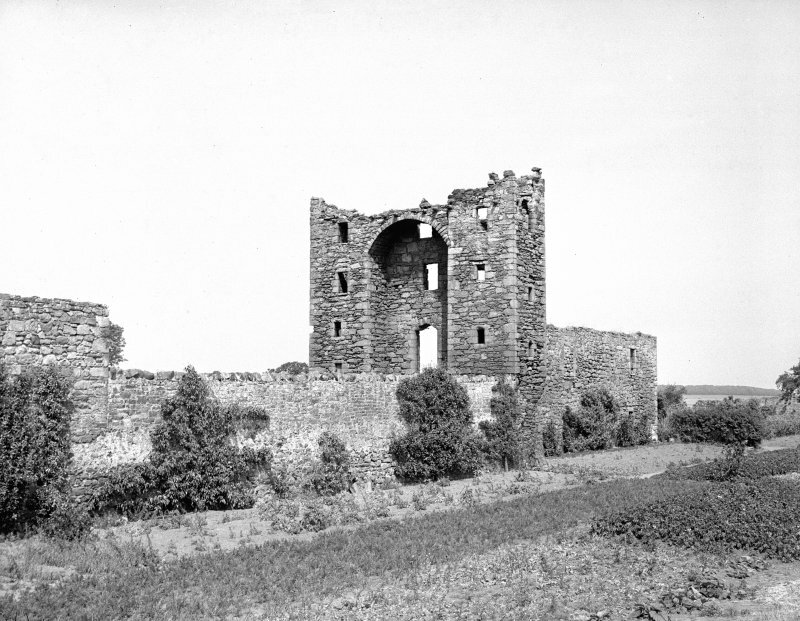 Saltcoats Castle is generally as described except that the main block, which is virtually intact, forms the W side of the courtyard. 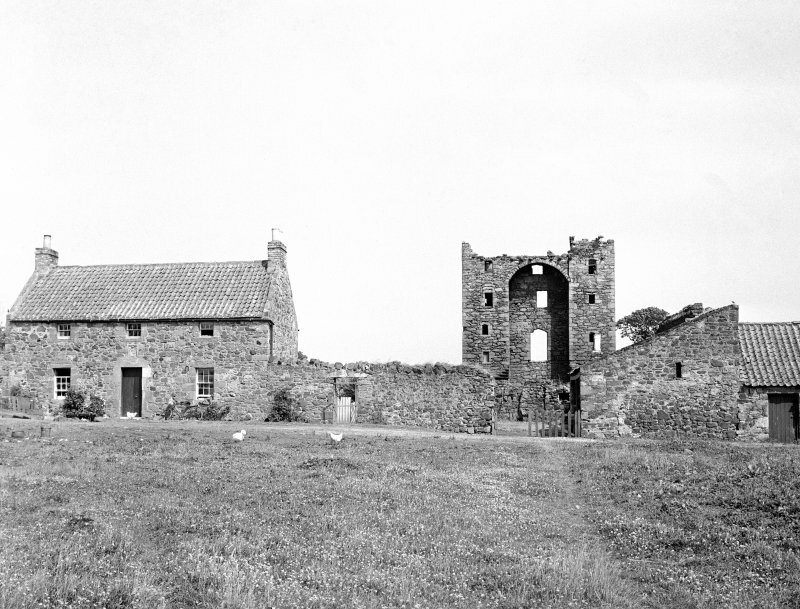 The armorial stone of the builder, Patrick Levingtoun of Saltcoats, now mounted over the front door of a nearby cottage, probably came from over the door of the castle, and the date must be 1592 (the second digit crudely recut as a 3).